The end of the epic, galaxy-shattering Seven Worlds campaign is near. And there's no better way to prepare for the end than with an action- and rules-packed module! In Exodus, the heroes have organized a fleet of civilian and military ships, and are now carrying the secret to stop the fearsome Devourer invasion. But can they reach Earth in time? They might, if they decide to follow a tip and shorten a hopelessly long voyage by taking a dangerous route. Unfortunately, rebel elements within the fleet have other intentions, and are willing to put everyone's lives at risk to stop the fleet from reaching its destination! A detailed computer map and hacking subsystem, designed to get players involved in retaking control of a mutinied battleship. This includes access to systems, security control, computer keys, and more! A climactic battle inside a zero-G sphere, complete with rules for moving in three dimensions within the sphere itself! And detailed rules to simulate the management and control of a rag-tag space fleet (inspired by that show about a rag-tag fleet, now Seven Worlds-style)! 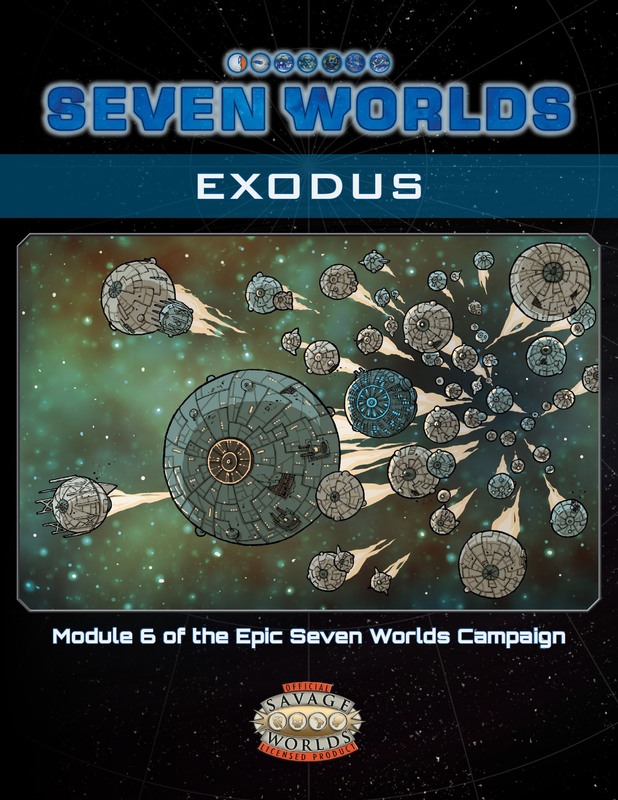 As always, if you were a Gamma-, Delta- or Epsilon-level backer you should have Exodus available as a new PDF in the Seven Worlds Campaign Subscription you have received through DriveThruRPG/RPGNow. Haven't received your backer links and rewards yet? Did you fill out the contact survey so we could send you the rewards? If you didn't, contact me at luis@intellistories.com for help. If you were not a backer for the campaign modules, you can still purchase Exodus as a stand-alone module at DriveThruRPG/RPGNow, or as part of the Seven Worlds Campaign Subscription. Purchase the subscription to get all seven modules (as they are released) at an almost 20% discount when compared with single module pricing. On top of that, the subscription also includes the full Seven Worlds Campaign Book PDF (a 253-page one volume compilation of all seven modules with exclusive Campaign Book cover art) at no extra cost! The greatest secret in the Seven Worlds is finally revealed!